Not only are they feeding, they are also trying to protect their young, as well, thus doubling the chances of getting bit. Springtime bass fishing brings thoughts of spinnerbaits and soft plastic lizards. Spinnerbaits allow you to cover large areas of water, quickly. When fishing a spinnerbait, you are usually looking for a reaction strike. By this I mean, if you get the bait close enough to a bass, it will bite the spinnerbait out of reaction to it being in it’s “zone” rather than just for a meal. In clear or slightly stained water, a white or chartreuse skirted bait tipped with gold or nickel blades, or even a combination of the two, would be in order. In muddy or extremely stained water, I like to use bright colored baits, such as orange or a fire tiger pattern. Since lizards or salamanders are a natural predator of the bass (they eat the eggs or the young bass called fry) a Texas rigged soft plastic lizard is also a good choice. I like to fish lizards around lay down logs and other cover along the banks of spawning areas. Bass generally like to relate to some form of cover when they move up shallow, build their nest and lay their eggs. 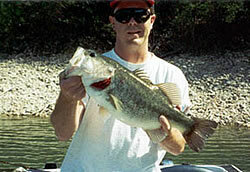 Bass begin spawning when water temperatures start to reach the 60’s. The best place to begin looking for spawning bass is on the north banks of a creek on a lake. The north bank is protected from the effects of cold north winds following the passage of a cold front. These areas tend to warm up sooner than other creeks and stay warmer, too. Another good idea is to concentrate on the west side of a north bank since it has all day to warm up from the sun. When fishing during the spawn, a good pair of polarized sunglasses is a must. It is imperative to be able to see bedding fish and underwater cover in order to effectively fish during the spawn. The polarized lenses eliminate the glare from the water allowing you to see into the water, depending of course, on the clarity of the water. I use Lure-Eyes marine sungear (http://www.LureEyes.com) exclusively for all my fishing. They have titanium frames, making them extremely lightweight, reducing fatigue during a long day or several days of fishing. The lenses are almost indestructible and they are priced under $100. When bass start shying away from spinnerbaits and lizards, I’ll switch to a Zoom trick worm or a Strike King flippin’ tube. I use a loud rattle inside the tube and will often spike the tail or tentacles of the tube chartreuse to give it more color. By using a large 4/0 or 5/0 Gamakatsu wide gag hook, I have a lethal combination of bait, rattle and hook to generate strikes from bedding bass or those getting ready to move up onto the nest. The tube has become one of my favorite baits for catching bass during the spring. When fishing the trick worm, I like to rig it weightless, and bury the 2/0 or 3/0 Gamakatsu wide gap hook when fishing heavy cover, even though I’ll usually use light line, such as 8-10 lb. P-Line. The lighter line allows the bait to sink faster than larger, heavier lines. I’ll work the bait over aquatic vegetation or flooded bushes on the banks. When fishing hydrilla beds or the edges of flooded brush, I’ll fish the bait wacky style. This means hooking the worm through the egg sack allowing the point of the hook to remain exposed, ensuring better hooksets. The erratic action of the wacky worm presentation seems to drive fish crazy, causing them to strike at the bait, even when they are not in a feeding mode. In most cases I can see a bass hit the trick or wacky worm. When fishing this technique and you see a bass hit the worm, it is important to quickly reel up the slack in your line, feel the pressure from the fish and then set the hook. Setting the hook too soon with result in misses. Spring is a great time to introduce youngster to the sport of bass fishing, too. You have an increased chance of success during this time of year. If you can catch a pretty day, take a young one with you and introduce them to the sport. It will be a great investment in their future, yours and the sport of bass fishing. Line watching has been a great way of detecting strikes in many types of fishing. It can be tricky at times, and especially when ice fishing with different light conditions. Straight-line fishing has a couple of detection times. The early one is when the line is seen to do something different, such as stop as it is going down, moving to the side, or a slight twitch downward and/or upward. It’s pretty safe to say that the post-spawn is one of the hardest times of year to catch bass, in fact, many anglers feel it can be brutal. Post-spawn begins right after the spawning stage, when the bass leave their spawning beds. Depending upon where you live the post-spawn stage can vary from February in the south to as late as July way up north. That first cast a smooth underhand pitch with a Pumpkin “Big Jig” and a brown grub trailer. The bait slides into the water with hardly a splash, slides down the old log, and “TIC” the line jumps and bait swims to the side you set hard and a fat 5lb bass fish breaks water “what a feeling”. You knew he’d be there, that nice piece of wood on the point next to the creek channel. You continue up the creek channel crankin’ a shallow Speed Trap not twenty yard and another bass, then another and about five fish later you’re at the back of the cove.